Who else has noticed that the tinier a human is, the more *stuff* comes along with them? What's with that? They have smaller shoes, smaller clothes, smaller books...how does it manage to take up so much more room? I feel like that's one of the questions of life that we will never have an answer for. In the meantime, us mere mortal parents will continue to struggle to find effective ways to organize the clutter that comes with the tiny humans we love. Right now, we have a 7-year-old, a 4-year-old (who will be 5 on 6/10! ), and a 2-year-old (who will be 3 on 7/4!!). The two older ones are the boys, the littlest tiny person is the baby girl of the house. For right now, all three of them share a room. That's what they do at their mom's house, and we aim for as much consistency as possible between the two homes in order to try to ease some of the difficulty caused by bouncing back and forth every other week. However, right now that means we have 3 small children occupying a space that measures in at a whopping 145 square feet. Are you ready to see what that looks like? Hold on to your hats here people, this is some #truelife style right here. That's a toy car laying on its side...I promise. 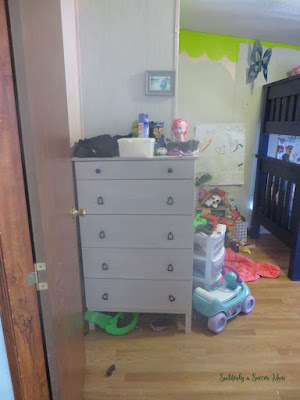 Walking in the door, the first thing is the dresser that all 3 kids share. This is the Ikea Tarva 5-drawer chest. I painted this long before the idea of writing my very own blog ever occurred to me, so I remember very little about what I did to paint it. I do remember I found a color I loved at Sherwin Williams and used it to make my own chalk paint, and I used these ring pulls. The small top drawer is filled with diapers for the baby, the second drawer has sports uniforms and overflow clothes, then each kid has their own drawer below that filled with play clothes. 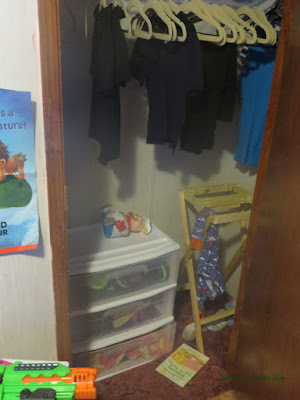 Their closet is actually a fairly decent size, but the single door limits my options a lot in here. The boys' school uniforms are hung in the closet, and the plastic storage drawers hold their shoes. Off to the right is that hamper I built, which I'm not loving. There is more storage to the left of the shoe storage, but it's all reach-in. I'm hoping to expand the door opening to 48" wide to make more effective use of the space. 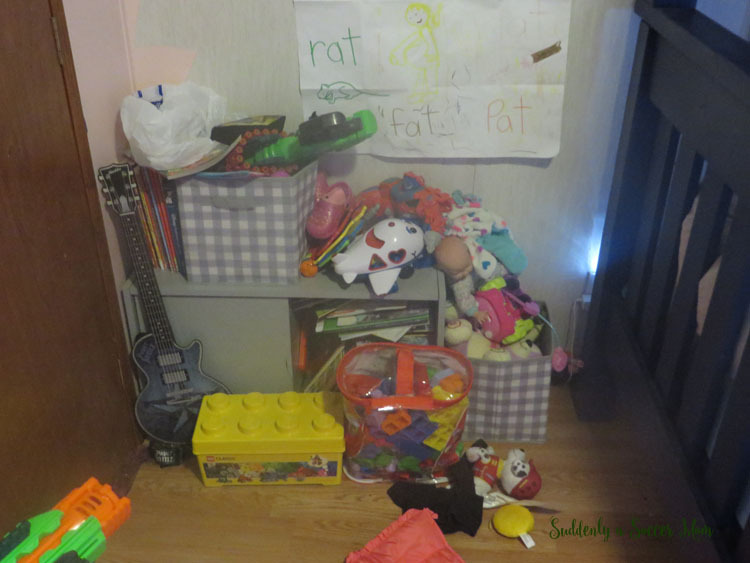 Toy "storage". Enough said. Books are also kept over here. Nothing about this space works, and it's a holdover from when we were still in the apartment and had fewer toys and even less storage space. 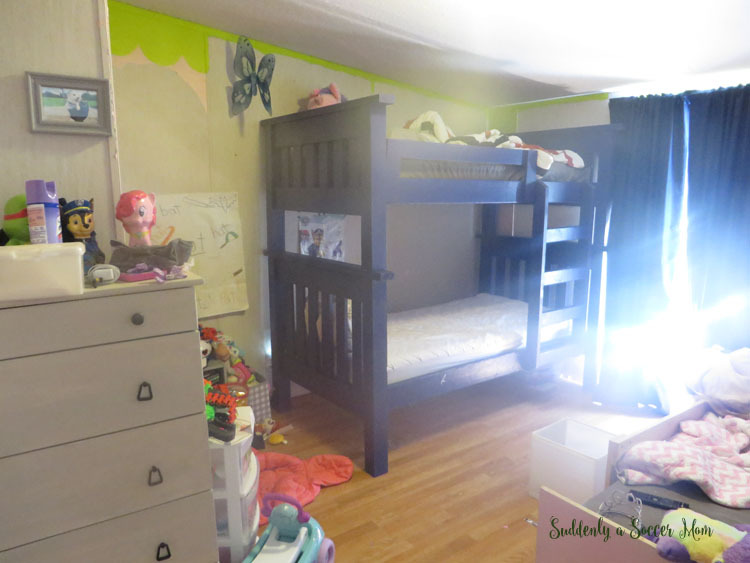 I'm still in love with the boys' bunk beds, even more so now that they're fully painted. Please ignore the missing bedding on the bottom bunk, we were cleaning out after strep throat hit all three kids. We just hung blackout curtains on that window, hoping this summer the total darkness *might* trick their internal alarm clocks and allowing them (and Deputy Dad & me!) to sleep past 6:30 am. The baby's bed is a simple plywood daybed-style that I partially pained in Behr's Funny Face. The original plan was to have an upholstered back to the bed, which we actually had built and ready. 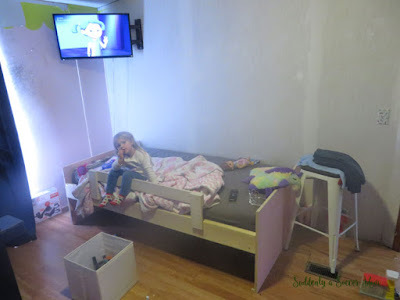 But I made it too big, then I got really annoyed with having it in the way, and ended up tossing since I decided I want to make her a different bed when she gets moved into a big girl room, probably next summer. And here's what I'm hoping to turn the room in to! I did this design mostly for the boys, since this will always be their room and the baby will get the room next door when she's ready. Since we just bought the curtains, I'm not going to get rid of them but I'm hoping to follow the awesome tutorials of those before me to paint the stripes on them. I want bamboo shades, too, just to add some depth and texture to the room. Wood tones aren't my favorite, so I'm planning on adding them in slowly and in small quantities. The cloth bin I'm hoping to pick up to replace the pillowcase hamper, because I'm just not loving it as much as I had hoped. The plans were great - I just hate having to check both sides of the hamper to see if there's any dirty clothes in them. 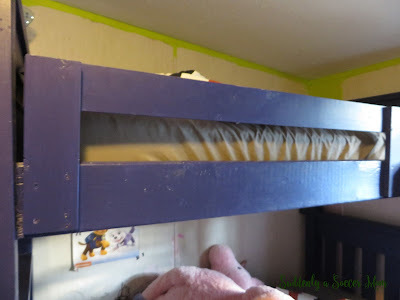 The bunk beds are already that shade of blue, which is Nobility Blue from Behr. For whatever reason, the swatch is not as vibrant as the color looks in real life. I'm thinking I want to go with French Silver, also from Behr, for the walls since it will be a nice neutral but appeases my deep love of the color gray. 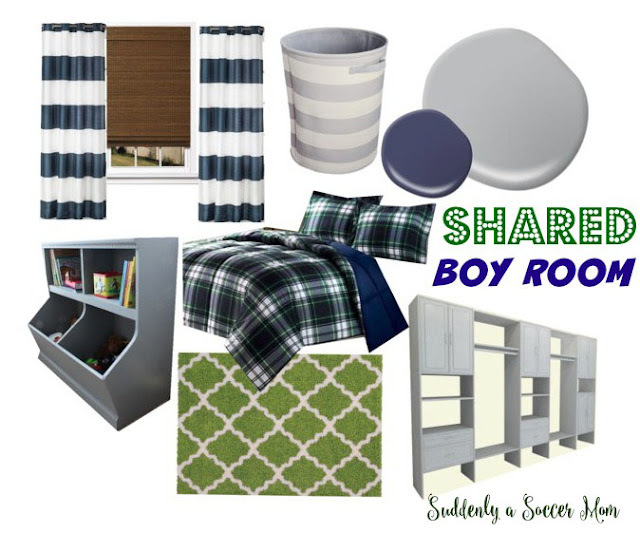 The bedding is no longer available, but is essentially what I want - a blue & green plaid. I really want quilts instead of the comforters though, so I'll have to keep poking around and find something that I love. The rug will provide a soft place to play and add in more pattern, which I'm currently loving. The toy storage will be a DIY using the plans from Jamison over at Rogue Engineer. I'm hoping to stain that in a similar shade as the blinds to add in some more of those wood tones! I want to add an extra top shelf to provide plenty of storage for books. 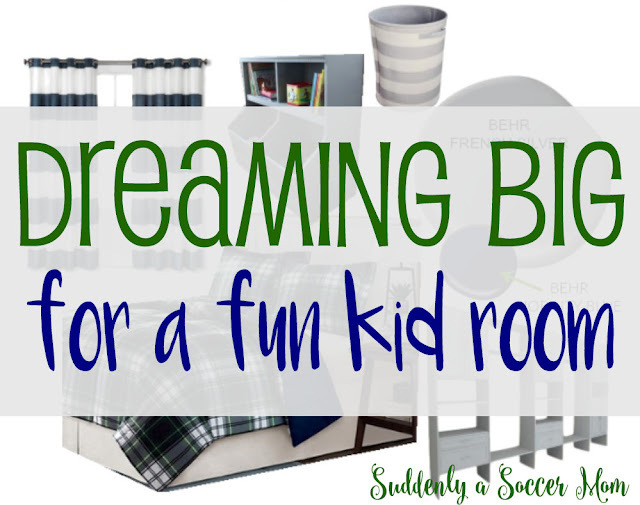 The closet organizer is way too big for their current closet but a girl can dream, right? I'll probably end up going with an awesome Elfa-type storage system for the closet instead. The other storage that's getting added, and sooner rather than later, is some under bed drawers for additional toy storage. I've got the wood for them, I just need to pick up some casters and find some knobs that I love. 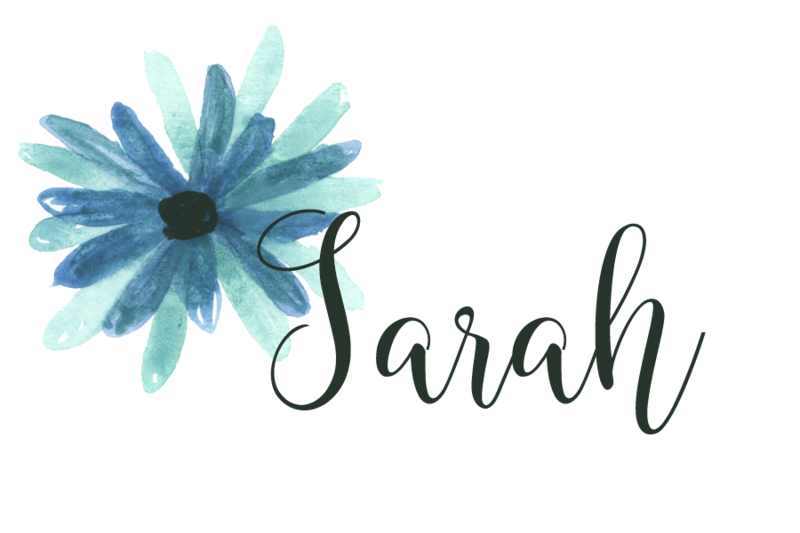 The makeover for this room will be a slow-moving project, but I love how it looks and can't wait to get a space that is cute and functional! P.S. >> The blue & green "theme" is coming from the Big whose favorite color is green, and the Middle whose favorite color is blue. What better way to have a room they love than to make sure they both have their favorite color well represented? I didn't want to go with any other "theme" because I want this to be a room that they love for a long time.